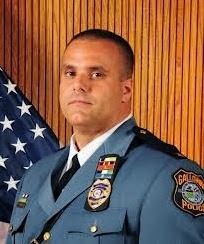 Galloway Township Police Chief Patrick Moran has come out to publicly defend his Police Department after what appears to be a handful of anonymous individuals criticizing the operations of the Police Department on Galloway Patch. Galloway Patch has since removed some of the comments however, Galloway Township News was able to capture the initial comments that spurred Moran's initial response prior to deletion. The anonymous individuals criticized the Police Department for not releasing information to the public in a more timely manner after incidents occurred and further accused the Police Department of not being proactive in crime related areas of the Township. In response to the critics, Chief Moran offered to meet with the anonymous critics in order to professionally address their concerns and criticism. A request that the anonymous critics appeared to have turned down. One critics even accused the Chief of snickering at him when they approached the Chief at a Council meeting to address these said concerns. Chief Moran did open up to Galloway Township News about his attempt to reach out to the anonymous critics in an "attempt to gain their prospective." 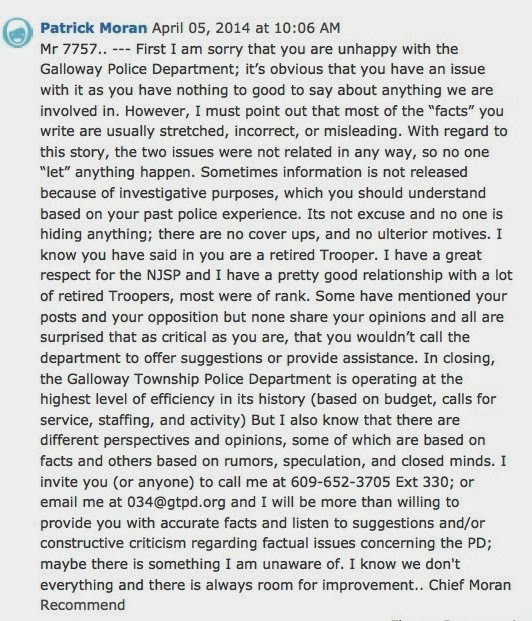 It appears the individuals did not want to cooperate as the comments triggered after the Chiefs response on Galloway Patch were later deleted, including a comment Galloway Township News left on the article in a further attempt to speak with the anonymous critics. Galloway Patch did not return our request as to why they deleted the comments and turned off the ability to further comment on that particular article that spurred the controversy. As Galloway Township reaches another pivotal year in their strained Municipal Budget, the Police Department may only be able to hire a few more officers in an already depleted Department. "The department is currently operating way below recommended staffing levels and with a budget that is over a million less than it was in 2009; so our resources are limited" Moran stated. "Cost of doing business is up, our calls for service numbers have risen, and the procedures that we are required to follow have increase the time it takes to handle a call. No one wants to hear that there is a staffing and budget issue, but it’s a fact" Moran further stated. "We currently do not have the staffing or the budget to support bringing any specialty units back. We have also asked other agencies for assistance and they could not help because of staffing levels or budget constraints of their own" Moran said. Galloway Township use to have a special Traffic Safety Unit and a COSAP Unit that worked as a primarily proactive resource for the Department. Chief Moran previously instituted a "Hot Spot" campaign in the summer of 2013 in which the results were phenomenal. "Over the past few years, we have been able to address swells in violence and accidents using overtime funding with proactive details. We used forfeiture funds last year but cannot use the funds for reoccurring costs" Moran said. Galloway Township Police Department has been working below the required guidelines for staffing. Many of the Officers gave for several years furloughs and even lay-offs that the Department has yet to fully recover from. "We have asked for added funding for this year but we are on a temporary budget and do not have the approval to use overtime for the details at this time" Moran said. "Our calls for service have increased over the past few years, the amount of car stops made by the officers have increased, and the amount of arrests continue to rise; there is no question the officers are working, we are not ignoring any issues, we are doing our best with what we have" Moran said. Galloway Township Council controls the purse strings of the Police Department. For additional funding it is recommended the critics turn their sights onto the Council and demand they increase the funding provided to the Police Department so the Chief can increase the staff and address the swells of violence and accidents. That's a big reason why I don't read the Patch anymore. For some reason they allowed two people to high jack their articles and post negative things. Mostly about the police but some other negative things too. I just got tired of it, now I get my local news from this site and the current. I'm my opinion this site is just better and impartial and most of my neighbors agree. I think GTPD is doing all that can be asked of them. Nothing but more pathetic excuses. No one is denying the fact that it is a budget and staffing issue. However, when the GTPD had 74 officers, they still stated that they did not have enough officers. Could you further clarify how Chief Moran "attempted to gain the perspective" of the critics? He still has not responded to the critics online or publicly. The problem isn't the staffing level of the police department, it is the lack of effort, an issue that they had even when they had 74 officers. Where does it say in his comment that he was willing to meet with these individuals? He only says call or email him. That does not equate to offering to meet with them whatsoever. The remarks by Moran do not answer anyone's questions. Yes we know about the budget situation and the staffing levels. However, the GTPD still can provide proactive patrols in high crime areas. How does that cost extra money? Can someone please ask him to answer concerns in a different way? It is getting tiresome to hear the same excuse over and over. I and a few others personally feel that the criticism of the GTPD is completely warranted. I don't see how it is so hard to constantly patrol an area (such as Club III). It is good to see that the Chief of Police finally answered those who have raised these concerns. However, there are still many questions that need to be answered. Constantly referring to the budget and their staffing level is getting to be a bit too old. Chief Moran has being doing everything he can to run the department with less and less each year. You can not get blood from a stone and the budgets they continue to pass keep asking for him to do that. Something needs to be done to help the Police help us. This can't continue much longer. I agree enough is enough! Stop cutting them! I could never understand the lack of depth of intelligence on the Township Council. When will they understand that the financial viability of this township comes from taxes. And, taxes are raised mostly-based upon home values. The only way to keep home values up and to retain homeowners in their homes is to have a strong and well-staffed police force. A LOW CRIME RATE KEEPS PROPERTY VALUES HIGH. Many homeowners are fleeing Galloway and renting their homes due to the upswing in crime. Now, renters, as a group are not to be disrespected but as a stereotype, a renter will not take as good care of a property if it is not his. Plus, the landlord will not keep the property as good as when he lived there. So, rental properties have a tendency to decline in appearances as time passes. AS CRIME INCREASES, PROPERTY VALUES DECLINE. Let's get more police now to protect our biggest investment - our homes. Let's get more police to keep out taxes from going up because as property values decline, the tax rate has to increase to cover the expenses of running this town. THE POLICE ARE AN INVESTMENT - NOT AN EXPENSE. Wake up Galloway leaders! "The only way to keep home values up and to retain homeowners in their homes is to have a strong and well-staffed police force." You really think people are fleeing Galloway because of the lack of Police. People...or moreso...families, are fleeing Galloway because it lacks in every single fundamental amenity that other towns provide to their homeowners and community. I don't think I even have to go into the laundry list because anyone who lives in the township is already in the know. Galloway is quickly becoming more of a bedroom community than a place to raise a family. The poor development planning that was put forth in the past to create a density of condos and townhouses off of collins ave. has basically created a city within a city that is plagued by absentee owners and renters that don't give back nor provide anything to the community. There are many reasons why values in Galloway are plummeting and not bouncing back as other communities are in the region and it surely is not the lack of Police. "....the amount of car stops made by the officers have increased" .....that is true. All week they were pulling over senior citizens by the dozens as they hid behind a tree in Smithville shift after shift.....psst, guys the bad guys aren't rolling through the stop sign at Moss Mill & Smithville Blvd....they're about 2 miles down the road. You're targeting the wrong people and misusing your officers precious time to shake down seniors for your fundraising efforts. Just because council won't earmark $ for your overtime shouldn't mean we have to pay for your financial woes. I agree with the comment about the crime rate. Yes it is true we lack several services that all contribute to the problem. However it makes sense. Take a 300k home in Absecon now move that home a 1/2 mile down the street to Pleasantville. That same house is worth 150k, why? Mainly because the crime rate is so high there. It makes sense. The negative comments are all naysayers. Walk a minute, mile or even through a crime scene as the Chief of any Department. The stresses that go with the task are more than some can handle which is why you are not a cop or you retire from being one. Galloway's Police Department has been shaken up and down and they still have yet to settle. Crime will occur anywhere, its the publicity of the crime that alerts the public of what is going on, only so they can protect themselves and their neighbor. The men and woman the Galloway Police Department deserve respect so give it to them. To the poster date April 17, 2014 at 12:51pm............. Residents like you are the reason that Galloway will never return to its once-greatness. Just read what you wrote: "....that is plagued by absentee owners and renters that don't give back nor provide anything to the community." Why do you think that there are absentee owners? I'll bet that it is because they found living where they were as unsafe and decided to move and to rent in order to recapture their investment. Every property in Galloway is upside-down partly because of the lack of public safety. The police need better equipment and more manpower to fight for the residents. The Galloway Police can only do so much. AND REMEMBER, THAT BESIDES BEING THERE TO PROTECT OUR SAFETY, THEY ARE PUTTING THEIR LIVES ON THE LINE TO KEEP GALLOWAY AS SAFE AS THEY HUMANLY CAN! These police offices have mothers, fathers, siblings, spouses, children and other loved ones. How much can they take before they transfer to a better-equipped police department? Being under-equipped and understaffed also puts their lives unnecessarily at risk. How many qualified officers decline the opportunity to be employed by Galloway because THEIR safety is compromised by the lack of adequate equipment and a low number of fellow officers? Township services are a luxury right now. Safety is paramount. Would you rather have leaf-free streets or would you prefer blood-free streets? Services will return when the township is able to collect the taxes that they earn from property values increasing. Do you really think that a new business will open in Galloway with its police force so understaffed? Wake up!